My family loves chocolate chip cookies. I think there are hundreds of thousands of people around the world who could claim that very same statement. But when I say that we love chocolate chip cookies, I mean, my brother in-law, who lives in a different city, is that father of five, and is a busy cardiologist, will sometimes text me and some other family members to share a chocolate chip cookie recipe that looks promising. So, when posting this chocolate chip cookie recipe I decided not to include a superlative in the recipe title. Although these cookies are much loved, I would never say they’re “the best”, “the most awesome”, or “the most delicious” because in our family we don’t discriminate against chocolate chip cookies. We love them all – chewy ones, soft ones, plain ones, fancy ones, salty ones, traditional ones, unique ones…you name it, we love it! 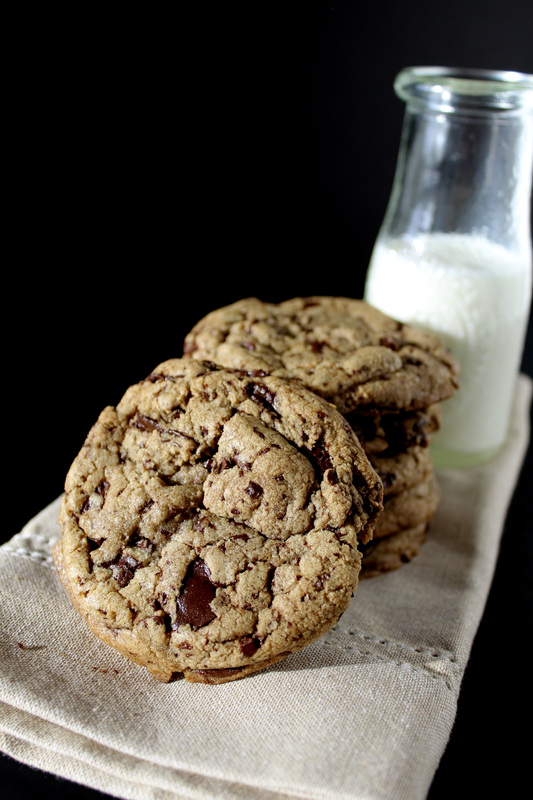 Although I can’t say that the perfect chocolate chip cookie exists, there are some common factors in all chocolate chip cookie recipes the produce amazing cookies. The first, and most important part of any chocolate chip cookie recipe is vanilla. There has to be a ton of vanilla in the recipe. The better quality vanilla you use, the better the cookie. 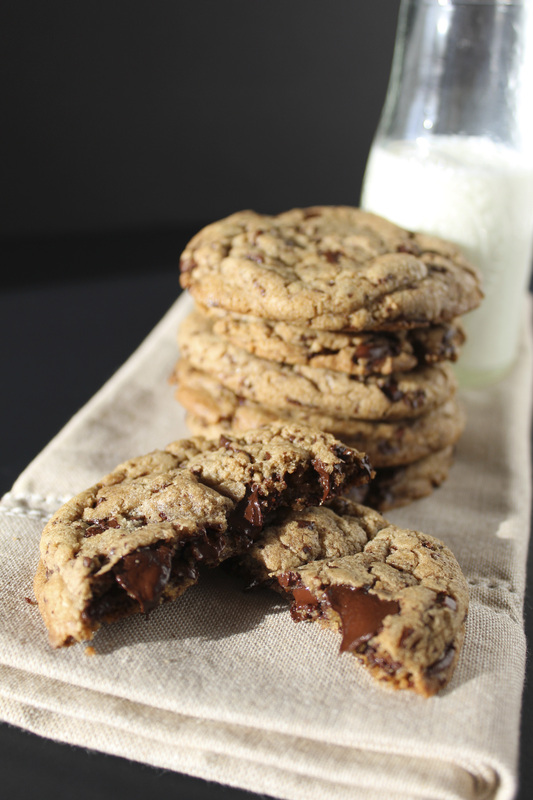 The second factor in a good chocolate chip cookie recipe is the chocolate. I prefer dark chocolate. For the cookies in this recipe, I chopped up a bar of chocolate with 70% cocoa, and it was perfect. I hope you give these chocolate chip cookies a try. They’re so worth it! In a medium bowl, sift the flours, baking soda, baking powder and salt. Set aside. In the bowl of a mixer fitted with a paddle attachment, cream the butter and sugars until light and fluffy, about 5 minutes. Add the eggs, one at a time, beating well after each addition. Then add the vanilla, and mix well. Add two tablespoons of the flour mixture to the chopped chocolate. Set aside. With the mixer on low, slowly add the dry ingredients. Mix until just combined. Add the chocolate and flour to the batter. Mix until combined. Scoop the dough out onto a piece of plastic wrap and form into a disk. Cover and refrigerate for 24 to 36 hours. Scoop walnut-sized balls of dough onto a parchment lined cookie sheet. Sprinkle with sea salt. Bake in the middle of the oven for about 15 to 18 minutes. The cookies may still look raw, but they will continue to cook after being taken out of the oven. Place the cookies, still on the baking sheet, on a wire rack to cool. Cool for about 10 minutes. Then transfer cookies to a wire rack to cool. 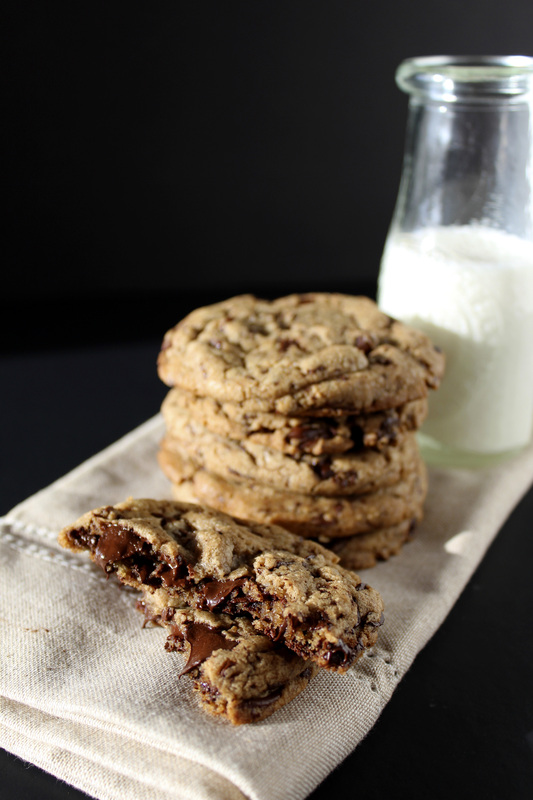 I’d never made chocolate chip cookies with anything but AP flour before this recipe either. These cookies are definitely worth it! Thanks for pinning. Aida, those cookies look absolutely perfect! Thanks so much Ang! Hope you have a wonderful weekend! Your cookies look delicious, I need them in my cookie jar. Thanks so much for sharing with Full Plate Thursday and have a great weekend! Thanks for the kind words Miz Helen! It’s a pleasure to party with you on Thursdays. Thanks for hosting! Thanks Melissa! I agree – every chocolate chip cookie that’s come across these lips has been pretty darn good! Definitely a favorite treat. So incredible! Thanks for linking up with What’s Cookin’ Wednesday! Thanks Alexis! They’re a really great version of everyone’s favorite cookie! I love chewy cookies. Thanks for sharing. I also shared on G +. I love your photography with the black background. This chocolate chip cookie recipe definitely makes it into my top five cookie recipes of all time! Thanks for pinning!